I have been remiss at posting things here like I should. I made a couple items lately that I thought it would be fun to share with you this drizzly Saturday. I have loads of rubber stamps, I even have my own line of rubber stamps...but ever since my introduction to digital stamps I haven't felt the desire to drag out my stamps and ink and make the effort. Today I decided it was time to do that. I forgot how much I enjoy the look of a stamped image. So here is my quick card using some Tim Holtz stamps I bought months ago on a whim and have never used until now. I hope you like? 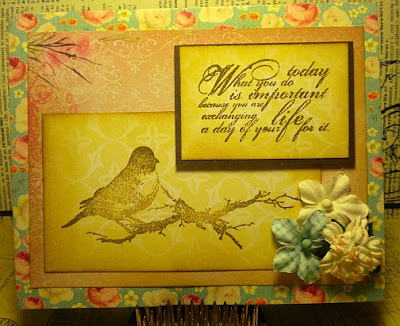 Last week I also started on a card that I think I will actually end up adding to a layout in a scrapbook page. I got the idea of it from pinterest, but as usual put my own spin on it. Well, that's all for now. I would love some feedback!